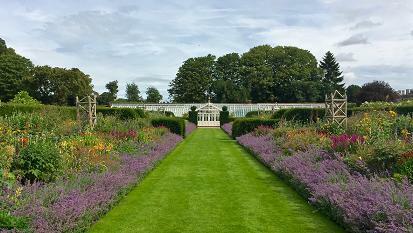 Renovation of the 5-acre walled garden at Houghton Hall began in 1991. 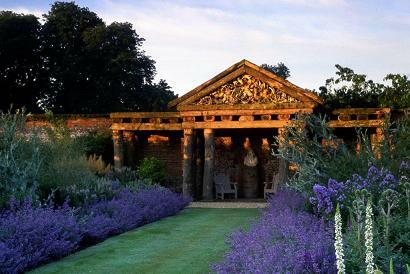 The former kitchen garden at Houghton Hall had fallen into a state of disrepair and Lord Cholmondeley was keen to restore it as a memorial to his grandmother. Although an area of productive kitchen garden has been retained, the larger part of the garden has been laid out as a series of ornamental gardens in various styles. The rose garden planted with nearly 150 varieties of both new and older roses. The central, box-edged parterre is based on the William Kent design for the ceiling in the White Drawing-Room. Plenty more to see in the award-winning Walled Garden with sunken pool, glasshouse with orchid collection and Jeppe Hein Waterflame. Deer park, Contemporary sculptures, Model Soldier Museum, Gift shop, licensed cafe, picnic and play area. Disabled access.